We at Teledyne Hastings Instruments are pleased to introduce the newest member of our vacuum measurement portfolio, the HVG-2020A. The HVG-2020A is a piezoresistive vacuum sensor with an optional touchscreen display that reads from 0.1-1000 Torr. The sensor uses 316 Stainless Steel as the wetted material and provides a gas independent pressure measurement, meaning your measurement will be accurate no matter what gas species is being used. The HVG-2020A features an excellent accuracy rating of ±(0.1% of Reading + 0.5 Torr). This rugged sensor comes in a number of system connections for ease of installation: 1/8” NPT, 1/4” VCR®, 1.33” Mini-CF, 2.75” CF, KF-16, KF-25, 1/2” Weld Stub, and 1/2” VCR. Let’s talk about some of the powerful features that allows the HVG-2020A to stand out. 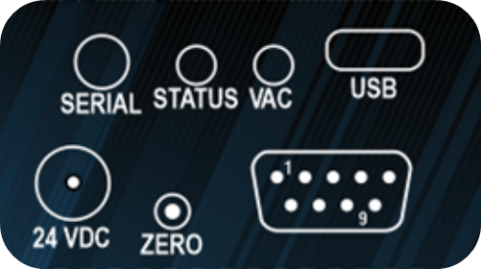 Analog I/O: The HVG-2020A has a 9 pin D-sub connector on top of the assembly that allows an analog output signal to be measured amongst other features. The selected linear analog output signal is proportional to the full scale range of the sensor (1000 Torr). Available outputs are 0-1 VDC, 0-5 VDC, 0-10 VDC, 0-20 mA, and 4-20 mA. The sensor will come configured from the factory with one of these outputs active, but can be easily changed by the user should output requirements change. Through the touchscreen display, there is a menu that allows the user to cycle through the available output options. If the HVG-2020A was configured without a touchscreen, the analog output can be changed via digital communications, which we’ll talk about in the next section. In addition to the analog output, the 9 pin D-sub will have Hi & Lo set points. The Hi set point is active when the pressure is above the set value and the Lo set point is active when the pressure is below the set value. Finally, the 9 pin D-sub has a pin for input power. The HVG-2020A can accept 12-36 VDC for power. In the event, the user doesn’t have 12-36 VDC to send via the 9 pin D-sub, there’s a 24 VDC input connection port that’s compatible with a bayonet-style power supply. Digital I/O: As mentioned earlier, the HVG-2020A has a few different methods digital communication can be established. First and easiest is the micro-USB port on top of the gauge. This will allow the instrument to be directly connected to a computer without the need for adapters or extra wiring. There is also a 4-conductor TRRS jack on top of the instrument. This port can be used for daisy-chaining gauges together with RS485 or a standard RS232 communication connection. Finally, the 9 pin D-sub will have two pins designated for TTL serial communication. These digital communications (with the exception of TTL) can be connected to a PC and used with our Free Windows software for the HVG-2020A. 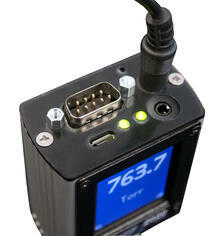 The software has a number of features including data logging and customization/configuration of the gauge. Digital communication also allows for command syntax to be sent manually to the instrument. These commands are especially important if the HVG-2020A was ordered without a touchscreen display. Through digital communication, the user can issue commands that change the analog output, adjust set point values, stream pressure readings, or change pressure units, just to name a few. Touchscreen Display: The most powerful feature of the HVG-2020A is the touchscreen display. 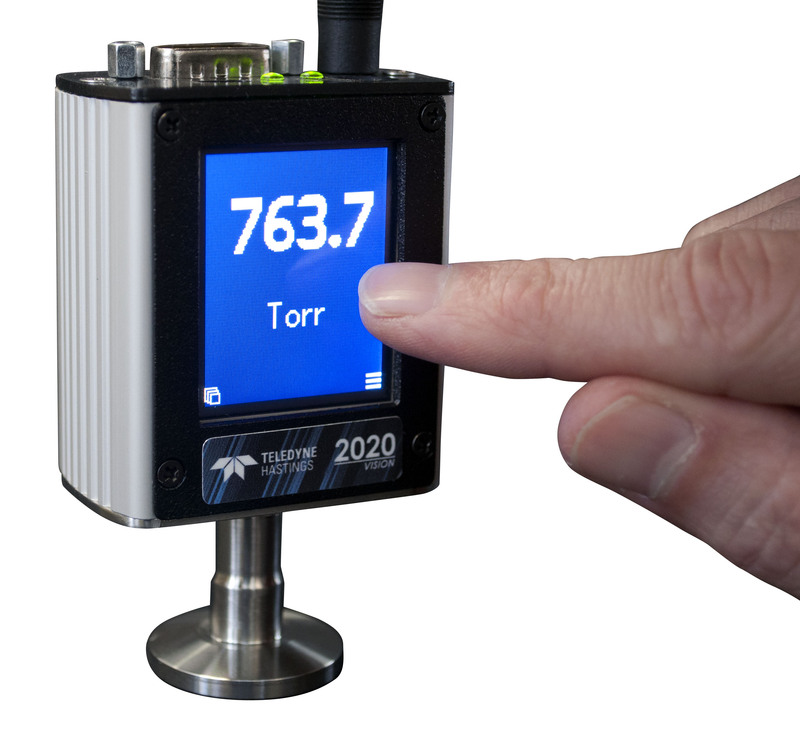 The intuitive display allows for quick visualization of the current pressure without needing to have a separate power supply or remote display. There are five available views to choose from (shown left to right below): Pressure View, Pressure & Temperature View, Set Point View, Bar Graph View, and Pressure over Time View. The pressure is always displayed on each of these five screens. There is also a menu button which will allow the user to cycle through a number of sub menus. Through these menus the user can change the screen orientation should they mount the gauge in a position other than vertical, set the zero (this should only be performed if the system pressure is known to be well below 0.1 Torr), view device information such as serial number and firmware levels, change the analog output, cycle between RS232 or RS485 and a number of baud rates, and finally restore the configuration of the gauge back to the original factory setup. The touchscreen display makes reading vacuum pressure as clear as 20/20 Vision! LED Status Lights: Lastly, the HVG-2020A features two LED lights on top of the instrument. These are extremely helpful in getting a general idea of the current pressure and status of the vacuum gauge. The chart below explains each combination of Status & Vacuum LED. The HVG-2020A vacuum gauge is ideal for many applications requiring rough vacuum measurement. 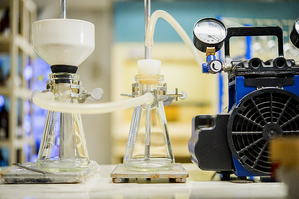 The picture on the right shows a simple lab set-up using a diaphragm vacuum pump & an analog needle gauge. The HVG-2020A would be a perfect fit for this set up. With the local touchscreen display, extensive wiring and configuration is not needed. Simply supply the gauge power and you are reading pressure. It’s easy to See why the “2020” is the vacuum gauge for the job! To learn more about the HVG-2020A or any of our other vacuum and flow products, contact us at hastings_instruments@teledyne.com, call 757-723-6531 (800-950-2468), or click the button below. VCR® is a registered trademark of Swagelok Company. Teledyne Hastings is working to expand our throughput so that we can better serve our customers by meeting increased demand while decreasing lead times. Over the last several months, we have added and improved calibration systems in both our vacuum and flow production areas. We have also purchased a new vacuum furnace which increases our production capacity. 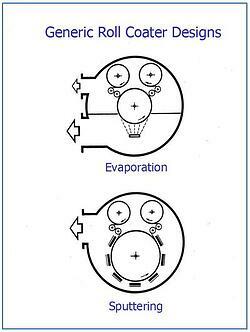 In this blog, we will describe what a vacuum furnace is, how it functions, and how we use it. 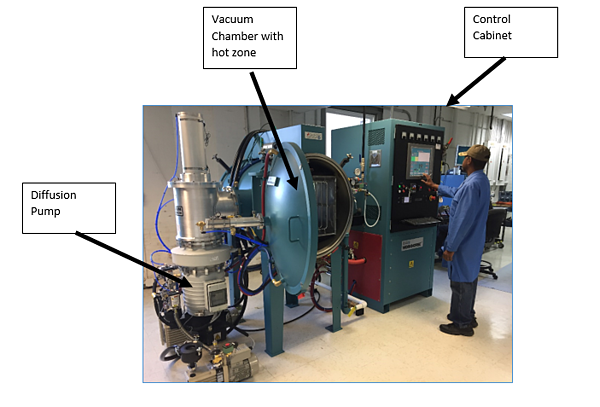 A picture of our newest vacuum furnace is shown below. The three major components of the vacuum furnace, from left to right, are the high-speed diffusion pump, the vacuum chamber with a high temperature hot zone, and the control cabinet. The diffusion pump is capable of pumping 180,000 lpm. While the pumping speed may seem unnecessarily high for the given volume, keep in mind that the gas load, at high temperature, can be very high. The diffusion pump is connected to the hot zone chamber via a large right angle vacuum valve. The diffusion pump is backed by a rotary vane vacuum pump. 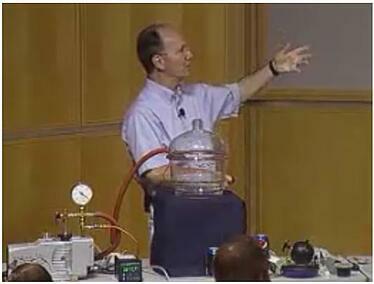 Pressures in the foreline can be monitored by using a Teledyne DV-6R vacuum gauge tube. The base pressure of the system, with the heat zone at room temperature approaches 1 x 10-6 Torr. Leon Whitehead at the controls of the new vacuum furnace. The hot zone is the heart of the vacuum furnace. A picture showing the inside of the hot zone is shown below. The effective hot zone size is 12”w x 12” h x 24” d. The molybdenum rod elements inside the hot zone are resistively heated once the system has reached sufficient vacuum. 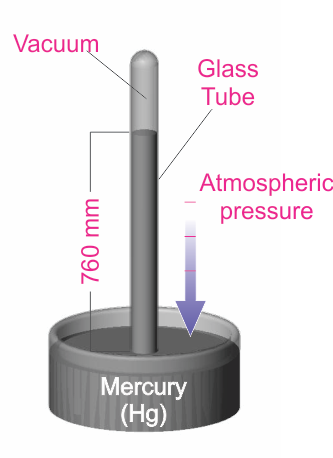 Under vacuum, the hot zone can reach temperatures exceeding 1300°C (2372°F). Inside the hot zone. Note the series of Molybdenum rod elements. The vacuum furnace is controlled by a touchscreen panel with PLC. The operator can select and execute a pre-programmed temperature/time profile for a given task. In addition, pressure and temperature at various locations on the system are monitored and displayed. The control cabinet also includes the transformers, contactors, and fuses. 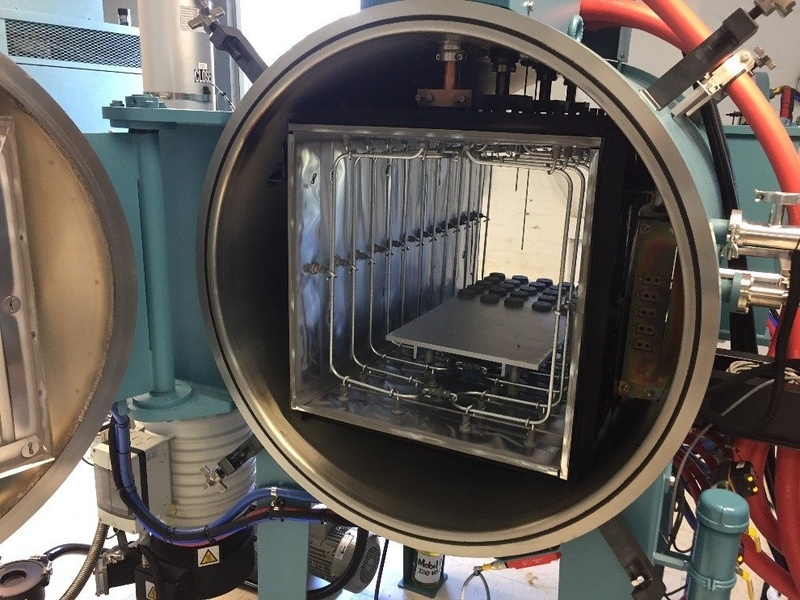 Teledyne uses our vacuum furnaces for both fusing and brazing operations - all while precisely controlling the environmental conditions within the hot zone. In a typical schedule, the system is pumped out to its base pressure and then the hot zone is brought up to 800°C. After reaching this temperature, the hot zone is held for a period of 20 minutes. Next, the hot zone is slowly ramped to 1100°C, which takes about an hour. The hot zone is then held there for up to 1 ½ hours. Teledyne Hastings Instruments is an ISO 9001:2008 certified manufacturer and we produce a complete line of instruments for precise measurement and control of vacuum, pressure, and gas flow. Our vacuum furnaces and the corresponding Quality Work Instructions deliver consistent results, which in turn provide our customers with high quality instrumentation. For information on Teledyne Hastings and our Mass Flow Meters and Controllers or Vacuum Gauges, please visit www.teledyne-hi.com or click the button below.